Not all fabrics shrink and require prewashing, in fact doing so may make your fabric harder to handle during the cutting and sewing process. I recommend prewashing a test swatch and calculating shrinkage before throwing fabric in the machine willy-nilly. All the details about how to do this are in this previous blog post. This automatically creates the effect of a graded seam allowance and reduces bulk. With the added advantage of preventing overlapping bits of fusing from ruining your ironing board cover! Excess folds of fabric at the back waist mean a sway back adjustment is necessary – right? Not always! There are other fitting factors that can cause the same or similar problems. These could be a short upper back, prominent buttocks or high hip, prominent bust, overfitted side seams, or a short torso. Make sure you diagnose the right problem for the right alteration! … that when you are setting in a sleeve, the area around the shoulder notch should have minimal ease? Distribute most of the ease to the sides, where the grain is malleable. This month I’m linking to an old Ready-To-Wear Tailoring Sewalong tutorial – all about how to bag out the lining in a jacket. As usual it is totally by machine, no hand sewing involved! 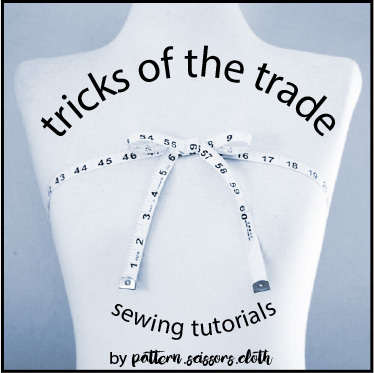 Actually there are two tutorials – this image links to the main blog post that focuses on the lining and sleeve parts, and the post after that shows how to finish off the hem area. That’s it for this month! I’m off to start on my suit refashion for Portia’s Refashioners 2017 challenge. I’m determined to finish it this year. Last year I started the jeans refashion and that half-finished project is still buried somewhere in my workroom! What’s your plan for the weekend? Thanks for the tip about ease when setting in sleeves – I didn’t know that, although it may happen that way by accident, as I pin the sleeves at the notches and then ease in the fabric between the notches. That’s a great tip re setting in sleeves! Thank you. I love all your tips, in fact I looked one up yesterday (bust darts pressing up or down). Fabulous tips again. I always learn something new from you. Love your tips! Regarding #3, do you have some advice on figuring out the true cause? Thanks!! Ooh you should totally update the tutorial on a notched collar!!! I found it way back when on the other site and it made it easy for me to do one…would be nice if the fabric were lighter! :please: haha! Agreed on the other points and I had someone suggest to me that I needed to shorten the upper bodice completely on a pattern and ah-ha! It was part swayback but really, the back bodice was just too long. On the prewashing; there’s so many reasons to do so aside from shrinkage. I looked at linking to the notched collar tute, but I was half asleep when I originally wrote it and sewed the collar wrong – not a great example lol! Apart from that it is a goodie and I’d like to rewrite it – and I’ll do it with light coloured fabric as you suggest! A lot of commenters mentioned dyes/allergies as reasons for prewashing, something I hadn’t considered. Great tips as always! Thankyou! Amazing tips as usual! Thank you. These tip posts are very very good.